Launch: Goose Island State Park, Rockport. Short, steep ramp and small but adequate parking. Nearby campsites: At the State Park. Comments: Leon, a local C-Dory owner, said it: "interesting and pleasant excepting the times when confronted by a strong norther." Folks are friendly, and Rockport with its facilities, including Coastal Marine that services Hondas, is just over the bridge. -----El was looking at a US Atlas and frowning. "We've had a short time on one coast and cruised several beautiful lakes. Now, it's time for another coast," she said with a slightly furrowed brow. -----"One down, two to go," I said with a chuckle. -----"Oh, goodness no. We have hardly scratched the surface along the Pacific edge," El said with a glowering look. It was obvious this was no time for joking. "We could continue along the Pacific in Southern California and down to the Baja. Rancher's Reward, that C-Dory we met in Lake Mead, is down there now. So let's wait until we hear from them before considering that area." -----"Good idea," I ventured. "How about the Gulf Coast?" -----"That's what I was thinking," El responded, her brow still furrowed. "But where?" -----"Texas should be warm enough, and it's certainly the closest. 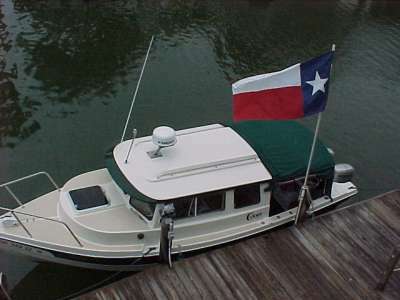 Maybe some C-Dory owners along the Texas coast could give us some advice. Should we ask on the C-Dory site?" I suggested. -----The furrows left her brow and El broke into a radiant smile. "Great! Try it." started a discussion on the Texas coast and asked for help. 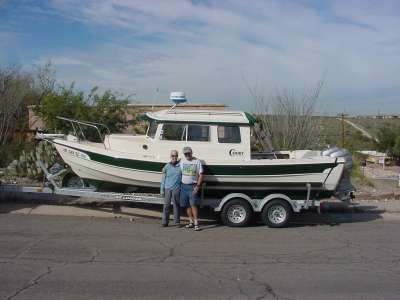 A few days later, Leon, a C-Dory owner responded: "The cruise from Brownsville to Houston is my favorite area. I have done it from north to south and south to north and in parts many times. The stretch from Brownsville to South Padre is sort of dull but from there on I found it interesting and pleasant excepting the times when confronted by a strong norther. 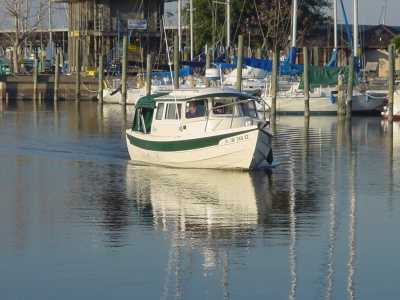 Marinas and anchorages are plentiful along the way." ----- He also suggested Rockport as a good starting point in about the middle of the coast and offered us the use of his charts. We headed south. -----Several days later, we were parked beside the Gulf near Rockport. The water of the Gulf lapped the coarse, shell-broken sand twenty feet from where we sat. A light misty rain drifted across the water like puffs of smoke. Skimmers flew like large black swallows over the water trailing their lower mandibles along the surface, plowing long faint furrows in the water. Winds were predicted for later in the morning, perhaps to be followed by heavy rains from intense thunderstorm activity - typical winter Gulf coastal Texas in a norther. We were off the road just in time. There was an incredible concentration of shore birds there, as though all the shore dwellers of the now-frozen north were crowded onto that thin strand - or they had to leap the Caribbean to South America. A daunting task for a bird that can't swim. 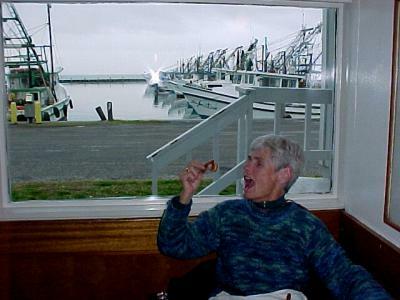 -----It only took a short time to get directions to the best seafood restaurant in the area, and El, as the Texans said, was soon in "hog heaven" with fresh shrimp from the boats tied off behind the restaurant. -----In the next few days, we headed to town to service the engines, supply for a lengthy trip, fill all the tanks, and pick up Leon's mail packet at the Post Office. It had the chart books, a guidebook, and detailed notes he made for us. We were ready, thanks to the C-Dory site and Leon. We launched and headed westerly. -----We cruised to the Mexican border from Rockport along South Padre Island - and back. Then we headed easterly to Houston and beyond. We, and Halcyon, were becoming experienced. We had cruised the Texas coast from border to border and what a great experience. Launch ramp: Public Ramp, Kemah. Good ramp under the bridge over Clear Creek and ample space for day parking the truck and trailer. Nearby marina: Excellent marina at Watergate Marina, Kemah. Long-term truck-trailer parking.